Arrange mushroom caps on a medium baking sheet, bottoms up. Chop and reserve mushroom stems. Prepare dry stuffing mix according to package directions. In a medium saucepan over medium heat, melt butter. Mix in garlic and cook until tender, about 5 minutes. In a medium bowl, mix together reserved mushroom stems, prepared dry stuffing mix, cream cheese and crabmeat. Season with salt, pepper, and garlic powder to your tastes. Form mixture into small meatballs and stuff mushrooms with the mixture. Drizzle with the garlic butter. Bake uncovered in the preheated oven 10 to 12 minutes, or until stuffing is lightly browned. These look really, really good. 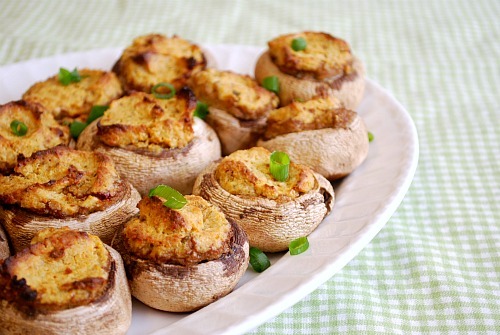 I love stuffed mushrooms although it's a little too easy to eat more than one! These look great. 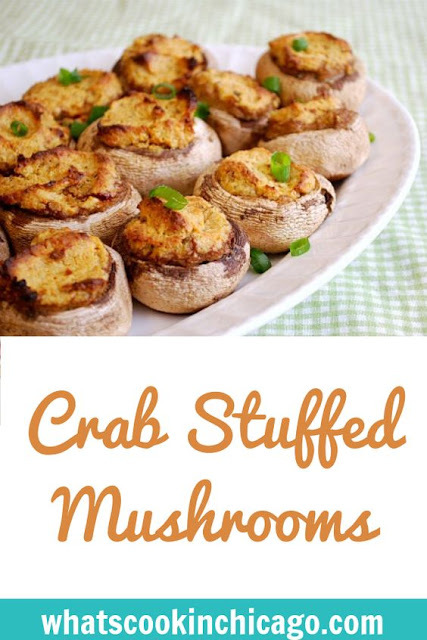 I love stuffed mushrooms and my husband loves crab so these would be perfect for both of us! These look wonderful - great way to use and showcase some yummy crabmeat! Is 2 cups butter a misprint?? Anonymous - nope! The 2 cups of butter isn't a misprint and is needed for the dry dressing to be absorbed. It's definitely a rich, yet delicious appetizer! This looks SO good! I am trying this! or anything you can advise? I get so much lately it's driving me mad so any support is very much appreciated.